With seeds, timing is everything. So making sure that exported seeds reach their destination quickly and efficiently is crucial for American seed producers and the international farmers who need them. Trade between nations regularly involves meeting strict government requirements that often create logistical obstacles for all parties involved. U.S. seed businesses often experience this when doing business with our cousins to the north. Canada is one of the largest importers of U.S. seed – with tons of seed worth millions of dollars being imported each year. Thanks to the close partnership between the USDA’s Agricultural Marketing Service (AMS) and the Canadian Food Inspection Agency (CFIA), American seed growers and businesses are saving thousands of dollars each year in these cross border transactions. Prior to 2007, American seed businesses shipping seed into Canada were required to test and label their seed lots to meet federal and state quality testing requirements. 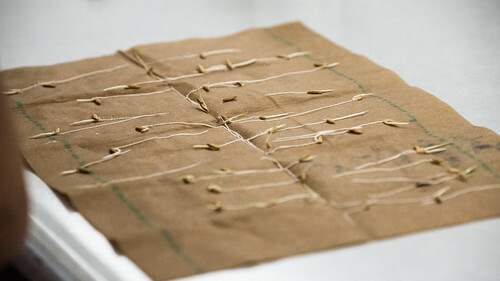 The seed was then transported to Canada where it was immediately retested, to verify quality and grade, before it could enter the Canadian market. Quality seed testing can take anywhere from four to 21 or more days to complete. If there is an error or uncertainty during testing, the retest needed could restart the clock. Meanwhile, valuable seed is waiting in limbo; which costs time and money. These delays coupled with quality testing costs, contract deadlines, and (most importantly) the hard cutoff Mother Nature gives to farmers for putting the seed into the ground, cause serious migraines for seed dealers and uncontrollable weight loss for their wallets. To solve this problem, AMS’ Livestock, Poultry, and Seed Program worked with CFIA to implement a program that allows AMS to train American seed analysts to become accredited seed graders for Canada. After completing the training and passing rigorous knowledge based tests, successful candidates are able to assign a grade name to seed lots scheduled for export to Canada. These assigned grades allow the seed to enter directly into the Canadian market, without having to be retested. Voila! No more duplicate testing, deadline headaches, or diets for the wallet. AMS offers training and testing for the Canadian Seed Grader program to seed industry professionals on a rolling basis yearly. AMS also offers a host of other programs aimed at making seed production and domestic and international marketing easier. These programs and services include process verified program accreditation, training workshops for seed analysts and samplers, variety name clearance searches, trait detection, and a variety of other voluntary quality testing services. The U.S. seed industry and the international market continue to grow to keep up with feeding the world’s population. AMS helps to ensure the availability of products that start with seed through the enforcement of laws and management of international programs that promote the interests of the U.S. seed industry. For more information, visit the AMS Seed Testing and Clearance website.